FREE Frappuccino - A treat for two from Starbucks! Frappuccino for two at Starbucks! Give some lovin' to your special friend, your hubby, your wife, your best friend, your dad, your mom, your boss and practically anybody you can bring with you at Starbucks! 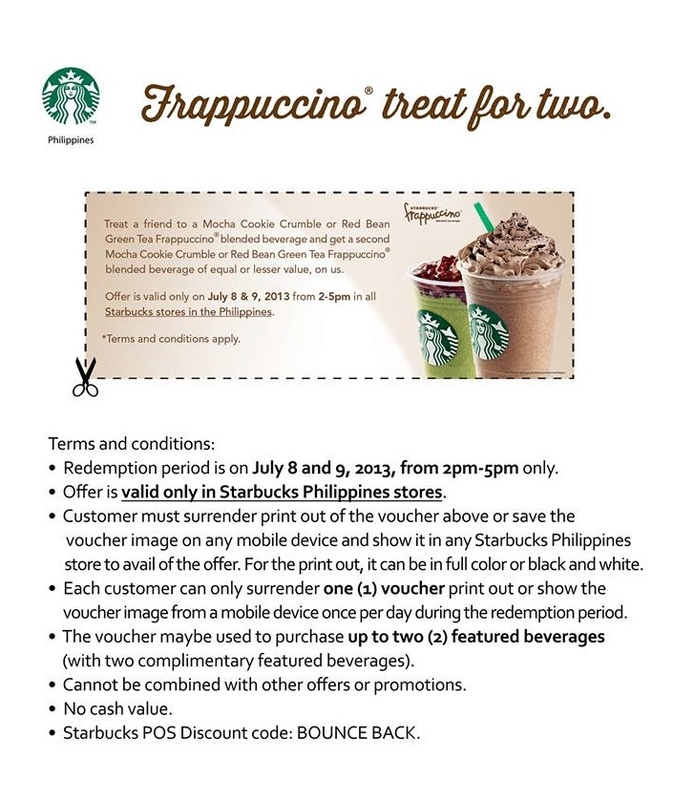 Just print the voucher above or save voucher image on your mobile device, present it at any Starbucks Philippines store and get to avail of their special offer! Just order for your friend a Mocha Cookie Crumble or Red Bean Green Tea Frappuccino and get a second Mocha Cookie Crumble or Red Bean Green Tea Frappuccino blended beverage of equal or lesser value from Starbucks! This unbelievable offer is happening on July 8 and 9, 2013 from 2 - 5 pm only! So don't forget to print out the voucher above and bring it with you so you can enjoy a great frappuccino with a friend. Trust me your friend is gonna love you more. You can only avail of this offer once per day, so after visiting on July 8 go back again on July 9 to enjoy the offer once again! King Chef Seafood restaurant celebrates their first year in Lucky Chinatown! King Chef Seafood restaurant, one of the most sought after Chinese restaurants in the metro today, recently turned 1 year old. And they are celebrating it with a bang! Probably one of the best success stories in the world of Chinese fine-dining restaurants in the Philippines, King Chef started just a few years back, when they first opened "Cantonese Soup Kitchen" serving up classic Chinese dishes in Banawe, Quezon City. Now they have blossomed to another much bigger site in Quezon City and now in Lucky Chinatown in the heart of Chinatown in Manila. I am proud to be celebrating with King Chef their 1st year in Lucky Chinatown. Now if you have not heard about King Chef, then I suggest you take a look and see what they have to offer your taste buds. And still if you're not convinced, they you indeed are missing a lot! McSpicy is just a McDonald's away! Just recently, Mc Donald's Philippines finally brought McSpicy to the Philippine market, after making waves at our neighboring Asian countries, I'm so happy we have finally joined the band wagon. Packed in one hefty serving, it comes with their wonderful packaging with everything you need to know about McSpicy. After hearing news that it has finally arrived, I rushed to my nearest McDonald's store, which is their Valencia branch, probably my most favorite McDonald's branch by far because of their very cold aircon. Ordered one without hesitation and here is what we have to say. Read the box, it has just the right amount of spice, and they really mean what they say. BonChon, the crispy chicken sensation raved about globally, is now serving the original Korean fried chicken secret the world craves for in the Summer Capital of the Philippines. 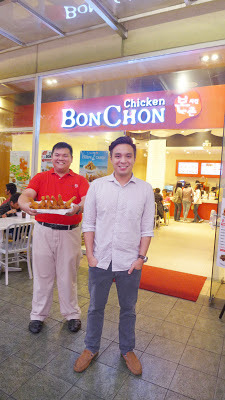 BonChon opens its doors in SM City Baguio, Breezeway Terrace, at the 2nd floor. BonChon, meaning “original village” in Korean, serves Korean fried chicken that’s super crispy yet light and not greasy, with hot moist juicy meat, and sauced with its addicting soy garlic or spicy glaze. From its original home in Seoul, BonChon opened branches in New York where its crispy chicken secret earned major media and industry accolades, as well as raves from discriminate diners. Its similar success in other US cities such as San Francisco, Boston, Virginia, and New Jerseyset the stage for the restaurant chain’s international expansion in Bangkok, Manila, Jakarta, Singapore – and later on in key Philippines cities such as Cebu, Davao, Cavite, and now in Baguio. Now with more than 45 stores in the Philippines at 2 years of operations, the company is well on its way of realizing its vision of having BonChon in every key city in the country. "Ms. Ma. Clarice Lao - Itumay"
Please wait for an email from me on how you can avail of your prize. Thank you all for joining! And hope you could join us again for our upcoming giveaways! I miss my dad, I miss the times when we would play cat and mouse, whenever he was chasing me to scold me, haha. I miss his laughter, the way he pronounces his English, and I miss the way he always smiles even I know we are having problems in the family. I admire him for his courage, his leadership and his love for our family, nothing compares to it. I even miss the times when I was pushing him on his wheelchair and assist him in getting on our car during weekends, but most of all I miss him because I just love him so much. I envy the people who still have their dads in their lives, and still wishing that he'd still be here by our side, but I can't change reality, he is the hero I have been looking up to, and the Superman of my life. 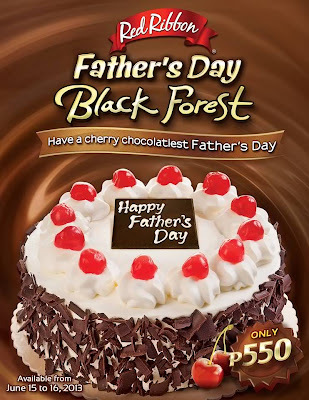 And this Father's Day, let's treat our dads to a day that he will remember for always. Wake up early to surprise your dad by cooking his favorite breakfast treat, or better yet have it served "Breakfast in Bed". Spend the afternoon watching Man of Steel and have dinner at his favorite restaurant. Let us give all the love he deserves. Dunkin' Donuts Day, June 15 Today - 10 ways to enjoy + FREE Donuts! Today June 15 is going to awesome as we celebrate the 10th year of Dunkin' Donuts Day! Year after year we get to enjoy this annual with free donuts and a whole lot of surprises, this year will be just as exciting but bigger and better! 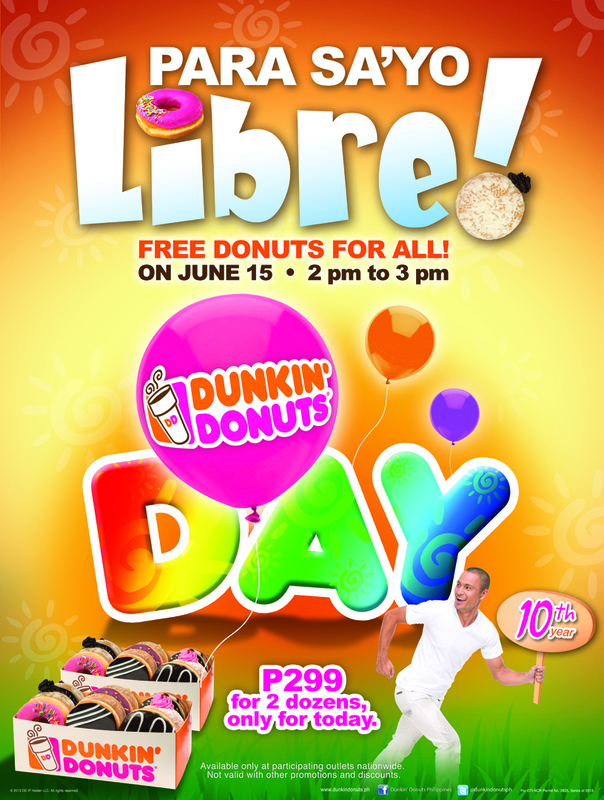 To thank our loyal patrons, this special day is dedicated to giving away free donuts for an hour, with lots of activities to make Dunkin' Donuts annual celebration an event to look forward to every year. To make the most of this celebration here are 10 things you can do to enjoy this day even more. Line up for your FREE classic donuts. A special Derek Donut – D’s Favorite is free from 2-3 pm. The donut is an inspiration of Derek Ramsay’s two favorites, the Boston Kreme and the Strawberry Filled. Visit your favorite Dunkin Donuts outlet. With the proliferation of Dunkin’ Donuts branches around the country, this shouldn’t be hard. 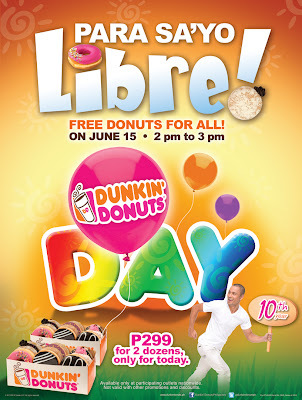 Get two dozen donuts for only P299. This promo is available only on Dunkin’ Donuts Day, so hurry and get your fill! Bring friends and family. There’s a reason why donuts are often bought in dozens – because they are best when shared. Taste new flavors. With endless selections from the Classics and Premium donut lines, go beyond your free Derek Donut and have a bit of each. Try other items! From savory snacks like bunwiches, croissants, and the Dunkcreations, to baked goodies such as the muffins and brownies, even those with no sweet tooth can find something to enjoy at Dunkin’. Participate in activities. With mascots, balloonists, photo booths and other surprises in store, there’s no reason to just keep your place in line. Find the perfect drink to pair with your donut. From brewed to iced coffee, to Dunkcoctions, there’s one that will match your craving. Spot Derek at Dunkin’. This heartthrob says there’s only Dunkin’ for him, so let him feed you one. Take a picture of yourself being fed by his likeness – it’s real enough to fool even Derek himself. Share your experience on Facebook and Twitter. Let everyone enjoy Dunkin’ Donuts Day even if they’re not with you. Share photos, your place in line, and even a shot of your free donut. 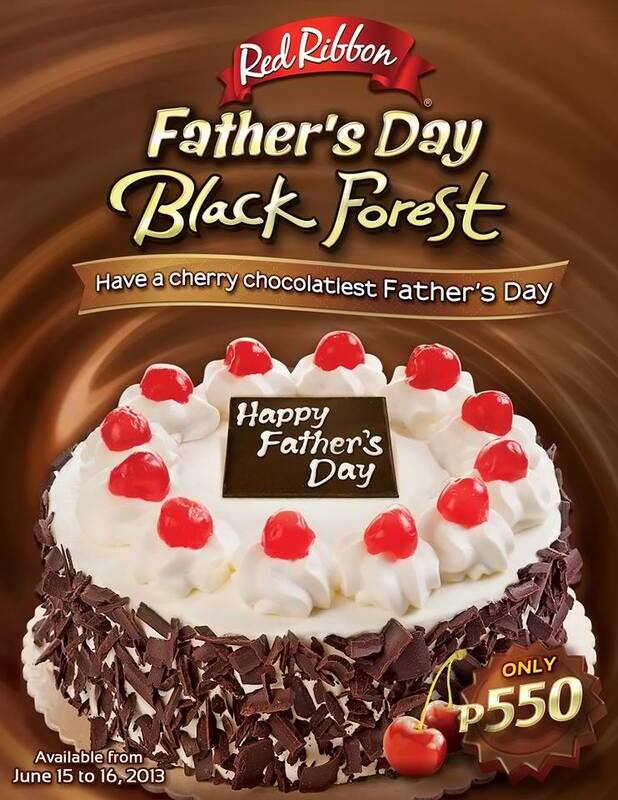 See you all at your favorite Dunkin’ Donuts branch! Who knows you might get to see Derek himself at your visited store. Now that would be a treat indeed. Some people eat to live, while we say we live to eat! And to share in that vision Electrolux presents to us the Electrolux Discover-E Food Festival happening this June 15 - 16, 2013. Get to witness a student cook-off, cooking demos, games and prizes and of course lots of food! 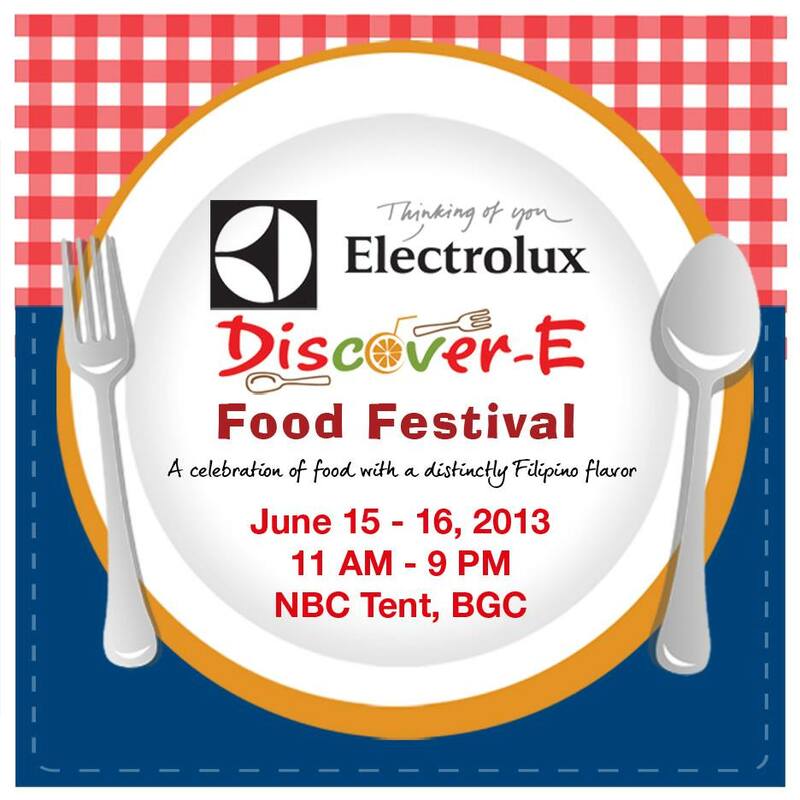 For just P50, you get a passport to taste and experience for yourself the joys of eating and learning to discover more of why we love to eat with Electrolux Discover-E Food Festival at the NBC Tent in Bonifacio Global City. What's more is that the more you taste the different food stalls the food festival has to offer, the more prizes you get to bring home, so be there and have a great time.... eating! 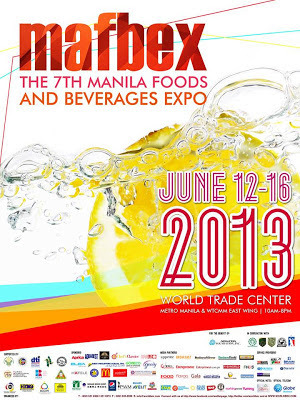 Be there at this year's Mafbex 2013. 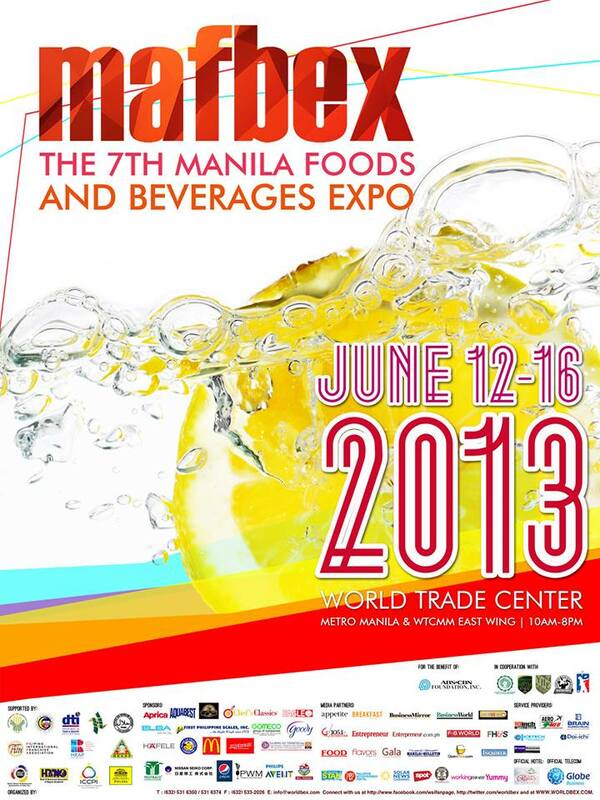 Happening on June 12 - 16 at the World Trade Center in Pasay City. Get to meet food suppliers, beverage suppliers, meet your favorite chefs do their thing on stage. Cooking demos from celebrated chefs, enjoy ethnic delicacies and get to see interschool and professional contests and battle each other out. See over 500 booths and 300 companies in this all-in-one-roof event. 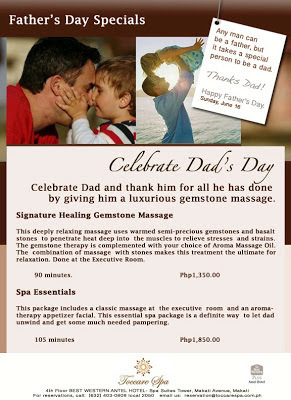 Celebrate Dad's Day : Give Dad a break he deserves at Toccare Spa + Gemstone massage giveaway for DAD!!! It's the first time I will be celebrating Father's Day without my Dad, after his passing last year, I can feel the emptiness inside me and I feel for my mother who has been missing him every single day. As we learn to appreciate more of what we don't have, we should also learn to appreciate what we still have. All of you lucky people who still have their Dad with them should be truly blessed, and with time passing by so fast, I do hope that you spend quality time with the man of the house and cherish every single moment that God has given him to you. That is why this Father's Day, Toccare Spa and The Food Alphabet recommends that you treat Dad to a relaxing and rejuvenating spa experience at Toccare Spa. 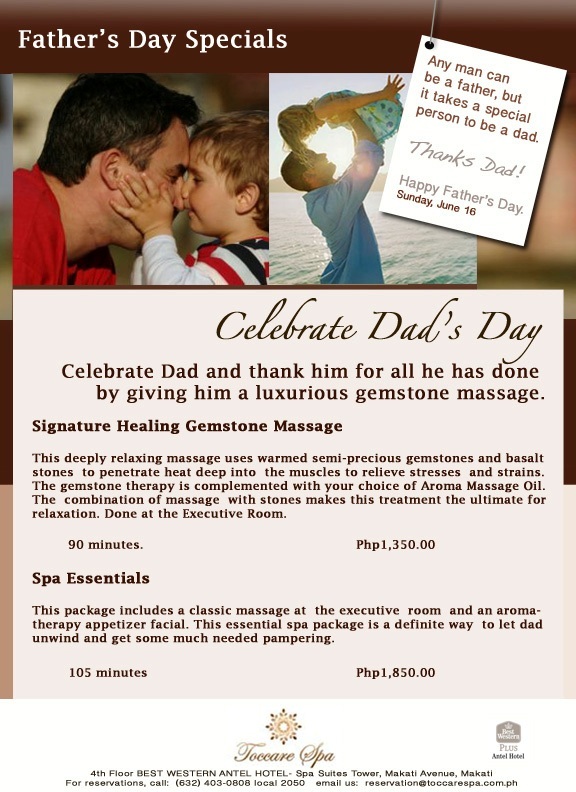 For the big man, revitalize and relieve stress with Toccare Spa's Signature Healing Gemstone Massage, complemented with your choice of Aroma massage oil is the ultimate relaxation package for Dad. Need some pampering, then give Dad the Spa Essentials treatment, a massage and an aromatic facial will set the mood for dad to unwind and enjoy the fruits of his labor. Congratulations! 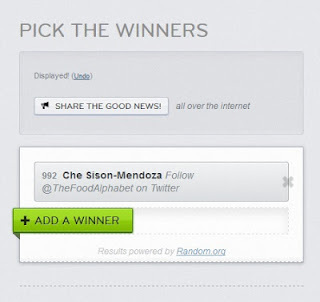 Please wait for my email on how to get your prize... 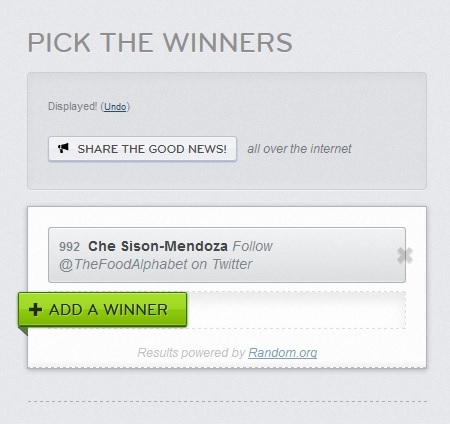 Thank you everyone for joining this exciting giveaway. But fret not, we have more GC's to give away, a spectacular buffet for 2 and more GC's! 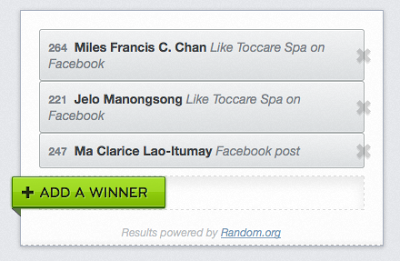 So keep on checking back to join these giveaways! As they say, a way to measure a real Chinese restaurant is with their selection and masterful creations of their Dim sum, and of course they have to taste so awesome that the aroma and flavor sinks in and stays in your heart. That is what Dim sum is all about, as the word "Dim sum" in Cantonese means. Here at Li Li Restaurant in Hyatt Hotel and Casino, they offer an irresistible offer of only P888++ for a Monday to Saturday Dim sum-all-you-can treat fit for every King, but wait how about I give you a treat, if you are to avail of the dim sum-all-you-can at Li Li, just mention that were able to read about it on foodalphabet.blogspot.com and you get their refreshing Guava Iced Tea worth P300++ for FREE, treat is only until the end of June. Dine in exquisite royalty with the many exclusive functions rooms that Li Li Restaurant has to offer, feast like a king and enjoy what life has to offer.